When it comes to sequels to surprise hit movies, it is kind of hard to see how or why they are deserving of a follow-up. Sure, a lot of money was made at the box office but does that mean that there is more story to be told regarding the same characters from its predecessor? 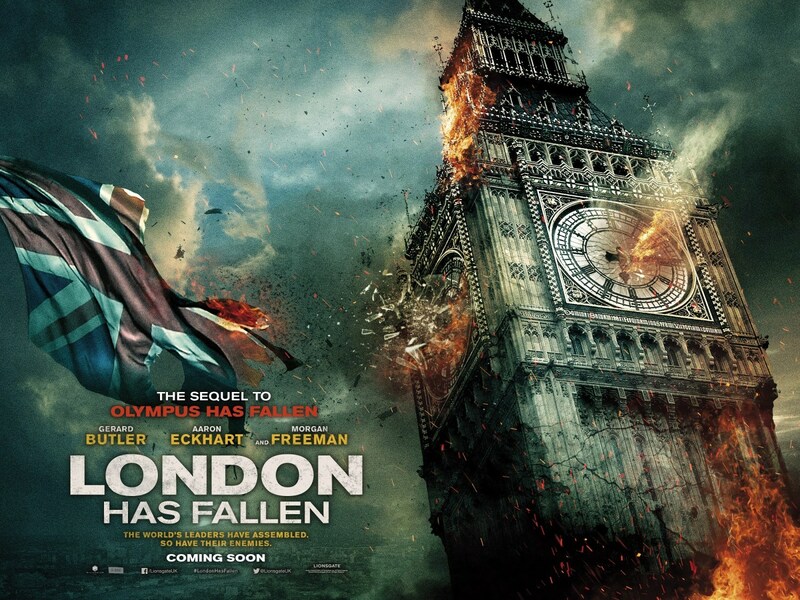 London Has Fallen is the sequel to 2013’s Olympus Has Fallen, which was one of two Die Hard clones that was set in the White House released that same year. (The other clone was the Channing Tatum and Jamie Foxx vehicle, White House Down.) The sequel was announced months after OHF’s theatrical run made $161 million worldwide on a $70 million budget. This film had some of its original cast return, particularly Gerard Butler and Aaron Eckhart reprising their roles as Secret Service agent Mike Banning and President Benjamin Asher, respectively. But rather than have terrorists attack the White House once again, this time terrorists attack London and it is up to Banning to save the day a second time. The story is not complex but neither was the first film’s plot. In the story, President Asher goes to London for a meeting with other world leaders after the British Prime Minister died, and then all hell broke loose because of the terrorists’ plot to eliminate all world leaders. It was basically a rehash of the first film’s plot but with a bigger location. I will say that when the attacks started it felt like it was the first film all over again with Afghan terrorists in place of North Korean terrorists this time around. Now I will not go into any political stuff, as at the end of the day, this movie was made to entertain audiences with nonstop action and the film did deliver on that. But there were some flaws in it. While it was good to see Banning and Asher enlist the help of MI6 in the fight against the terrorist faction, it would have been better to see a team-up between Butler’s character and the main MI6 agent, Jaquelin Marshall (Charlotte Riley). She really had little to do in her time on screen and in the end, it felt like it was all up to the one-man-army that was Mike Banning. Also, even though a few other actors from this film’s predecessor appeared, they were not in it enough. For example, Morgan Freeman’s character had a smaller presence in this film as opposed to in the first one. The same could be said about Angela Bassett’s character, who also had a bigger presence in the first film. What separated itself from the first film, however, was that there was a little more levity this time around. Now I may be one of the very few people on this planet who actually preferred White House Down over Olympus Has Fallen, even though I still liked the latter, but what made me prefer WHD over OHF was that there was a little more humor involved. Olympus Has Fallen felt like it was too serious all the way through, but LHF included a few one-liners that got me chuckling here and there. This was not a great film by any means, but it was entertaining enough that it was watchable. It’s a decent way to pass the time but there were some problems with it – lack of screen time for some actors, some dodgy CGI at times and the story was just a rehash of the first film. But still, I had fun watching it, even though there were some flaws in it. At best, it was just an average film.